Tougher, stronger and more capable off-road than ever before, the all-new Toyota Hilux heralds a new era for the pick-up, with style, comfort, safety and advanced technology to satisfy the most discerning users. First released in 1968, the legendary Hilux has been a dominant presence in the global pick-up market for nearly 50 years. To date, the world’s favourite pick-up has recorded cumulative global sales of over 16 million units. 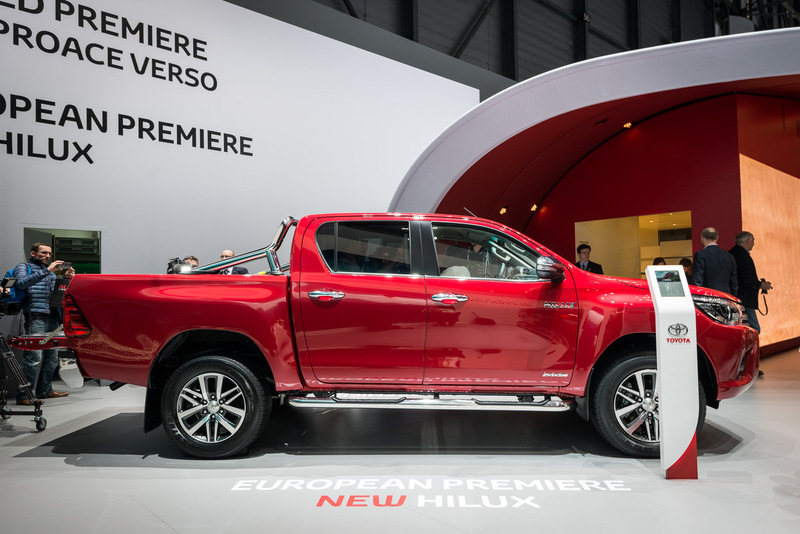 In Europe, some 34,000 Hilux vehicles were sold in 2015, representing a 23.1 per cent share of the segment and making Hilux Europe’s best-selling pick-up. Renowned for its Quality, Durability and Reliability (QDR), the unstoppable Hilux continues to conquer all types of terrain and achieved podium finishes in the 2016 Dakar Rally. For all the news from the Geneva motor show, visit our hub page here. 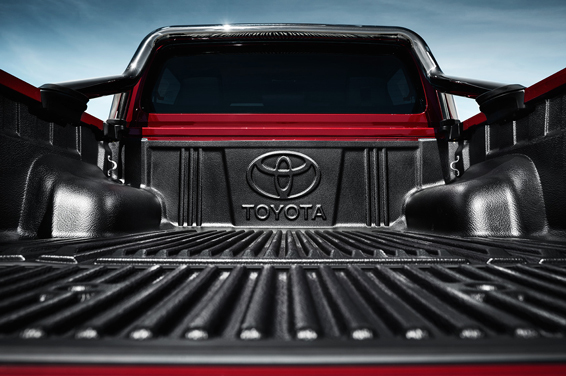 Available in Single, Extra and Double Cab body styles, the new, eighth generation Hilux builds on this legendary reputation and invincible QDR, redefining toughness with a new and stronger ladder chassis, reinforced deck structure, enhanced 4×4 capabilities, plus an improved towing capacity. The introduction of a 2.4-litre D-4D Global Diesel (GD) engine featuring Stop/Start combines vastly improved torque delivery in the low and medium speed ranges with class-leading fuel economy. The 16 valve, DOHC four-cylinder engine is equipped with a variable nozzle turbocharger with intercooler. The 2393cc unit generates 148bhp @ at 3,400rpm, and maximum torque of 400 Nm between 1,600 and 2,000 rpm. 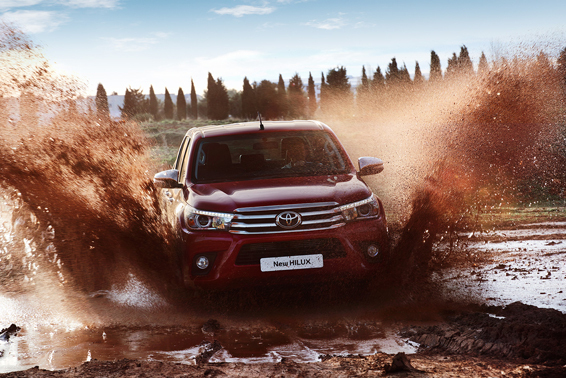 Two-wheel drive Hilux versions are equipped with six-speed manual transmissions, whilst all-wheel drive models offer a choice of six-speed manual or automatic gearboxes. Both transmissions have been extensively revised to improve durability, enhance low-speed driving performance and offer drivers quieter, smoother gear changes whilst realising the full potential of the new engine. All versions achieve a top speed of 170 km/h and accelerate from 0 to 100 km/h in 12.8 (6A/T) or 13.2 (6M/T) seconds. The new 2.4-litre D-4D returns an average fuel consumption and CO2 emissions as low as 39.8mpg* and 187 g/km*, improving fuel efficiency by nine per cent. The all-new Hilux features a newly developed ladder-frame chassis offering a 20 per cent increase in torsional rigidity. It is designed to combine improved handling, ride comfort, noise and vibration performance and collision safety with outstanding durability in even the most extreme driving environments. The tough, durable leaf spring and twin shock absorber rear suspension system has been extensively revised to combine the off-road articulation capabilities expected of a rugged all-wheel drive workhorse with SUV-like ride comfort and handling stability. The vehicle is equipped with a switchable all-wheel drive system featuring a high and low-ratio transfer case, and both front and rear locking limited-slip rear differentials. Acting in combination, the vastly improved low and medium speed torque delivery of the new diesel engine and the increased strength of the new ladder-frame chassis have raised the towing capacity to 3.5 tonnes (for the UK market). 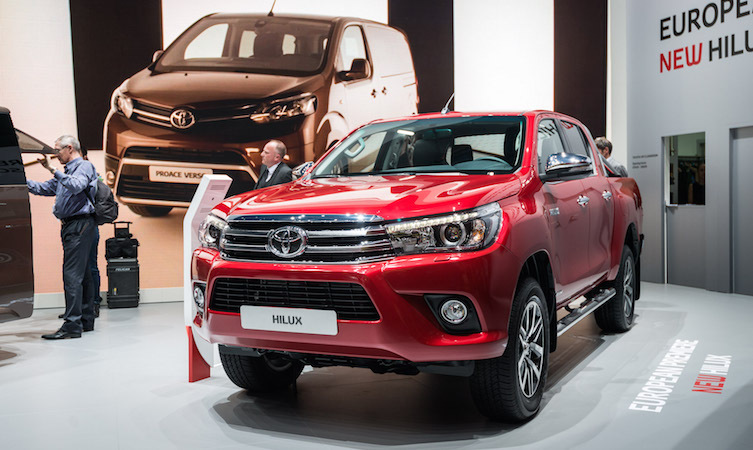 The new Hilux sees the introduction of Toyota Safety Sense. Processing information provided by a compact, windscreen head-mounted unit housing both a laser and a camera, Toyota Safety Sense offers customers a Pre-Collision System (PCS), Lane Departure Alert (LDA), Automatic High Beam (AHB) and Road Sign Assist (RSA) systems. 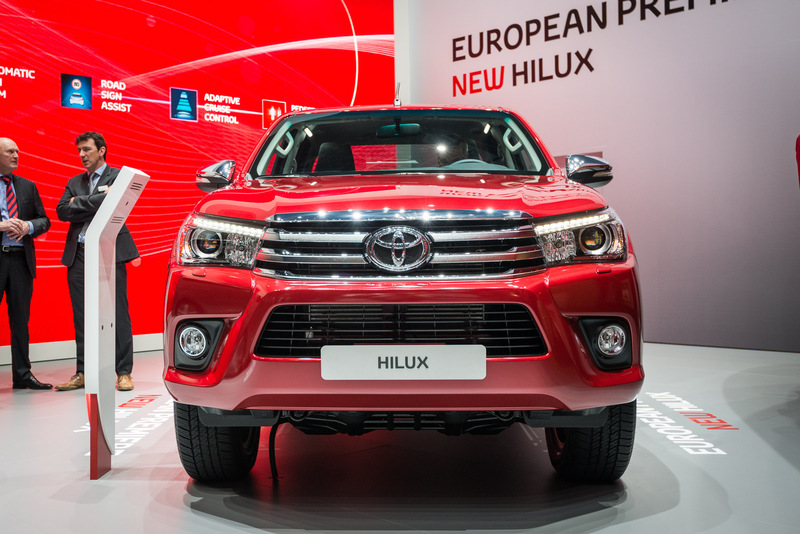 At 5,335 mm long, 1,855 mm wide and 1,815 mm high, the new Hilux is 75 mm longer, 20 mm wider and 45 mm lower than its predecessor. The combination of toughness and refinement is expressed in the new front with the sleek styling of a unified upper grille and headlamp design with a deep, powerful bumper housing the large lower grille. The bonnet wraps over the front wheel arches to reinforce the solid, road presence while the second horizontal bar of the upper grille extends into the new headlamp clusters to form a unique Daytime Running Lamp (DRL) signature featuring 12 white LEDs. With the ‘Hilux’ signature integrated within the side of the casing, the new headlamp clusters wrap around the front wings to further emphasise the width of the new pick-up. The advanced technology of the headlamp design also incorporates powerful LED low-beam projectors, (available on higher grade models). Below the bumper, the placement of the fog lamp housings at the bumper extremities reinforces the solid, stable front stance. The lower corners and bottom of the bumper have been shaped to optimise ground clearance under even the most extreme off-road driving conditions. To the sides, the design favours a more seamless transition of the front bumper into the muscular front wheel arches for a more refined appearance. The profile sees the use of a thick lower door cross-section which links front and rear wheel arches – the latter now seamlessly integrated within the body – before curving upwards to anchor the wrap-around rear lamp clusters. Greater style is added to the design through the adoption of a blacked-out B pillar within the smooth, rear-slanted silhouette of Extra Cab and Double Cab model cabins, along with a choice of new 17 and 18-inch alloy wheels. On Double Cab models, the linking of the cab and rear deck with a chrome beltline further unifies the overall design. The cab roof has been carefully shaped to improve both its styling and practicality. It now features an aerodynamic ‘pagoda’-style ‘V’ shape that helps channel air over the roof and off the sides of the vehicle. The antenna has been repositioned further forward to keep it clear of bulky loads or deck attachments. The deck itself has been made stronger to reduce deformation and damage when loading or unloading cargo. The floor ribs have been redesigned and sill cross-members added to the floor panel. The header panel has been reinforced, and the shape of both the wheel-house rib reinforcement and the service hole cover on the tailgate optimised. The all-new Hilux is available in a choice of five popular base colours, and three new eye-catching colours: Orange Spice, Volcano Red and Hydro Blue. Accessed via a Smart Entry and Start system the all-new Hilux interior combines the durability and functionality required of any working vehicle with SUV levels of refinement, and equipment. The horizontal emphasis of the clean, uncluttered dashboard design incorporates new, cross fin-type air vents with rotary dial adjustment. The centre console is dominated by the integration of a robust, tablet-like seven-inch touch-screen multimedia system. Operated simply and intuitively using fingertip control, the unit has been moved closer to the front seats for ease of use. A new driver’s instrument binnacle locates large, clear, analogue speedometer and tachometer dials either side of a full-colour 4.2-inch TFT multi-information display. Its content changed quickly and easily via a steering wheel-mounted switch, the display places the most pertinent driving information at the highest position on the screen to minimise the shift in line-of-sight whilst driving. Featuring a horizontal spoke design steering wheel it incorporates reach and rake adjustability, thumb rests, and a thicker, stitched rim to guarantee a comfortable grip for all drivers. Integral switchgear -including a four-way rocker switch- allows for quick, easy control of the six-speaker audio and multi-information display systems, as well as linked operation of the seven-inch centre console and multi-information displays. In keeping with the more leisure-oriented interior design, the gear lever has been shortened to give a slicker, more passenger car-like shift action. In addition, drive mode selection, including all-wheel drive, is now simply made via adjacent, easy-to-use switches. The premium appearance of the new Hilux interior is reinforced by metallic coated ornamentation to the dashboard, door trim, driver’s instrument binnacle, steering wheel and gear lever bezel. Interior lighting sees the adoption of consistent blue illumination and instrument backlighting throughout. The black seat upholstery of the new Hilux interior is available in a choice of three finishes. Entry grade models feature a tough, hard-wearing fabric, mid-range feature a high quality, soft-textured durable fabric, while high grade models are upholstered in full leather. For those of us owning older Hiluxes, where can we find a .GPX file containing the geo coordinates ( and phone number would be useful) of all European Toyota servicing dealerships for use in our Garmin sat navs please? Sounds obvious, but if we knew where these were as we travelled, it would brin g in more business to Toyota! so how about making such a file available and downloadable please? Thank you for your post. At present we have no more information, however keep an eye on our blog for more information. Many thanks. When are the specs for the 2.8d doing to published or we the UK only getting the 2.4d? When will these be available to test-drive?